Original caption: Mortars of the 511th Infantry Regiment. 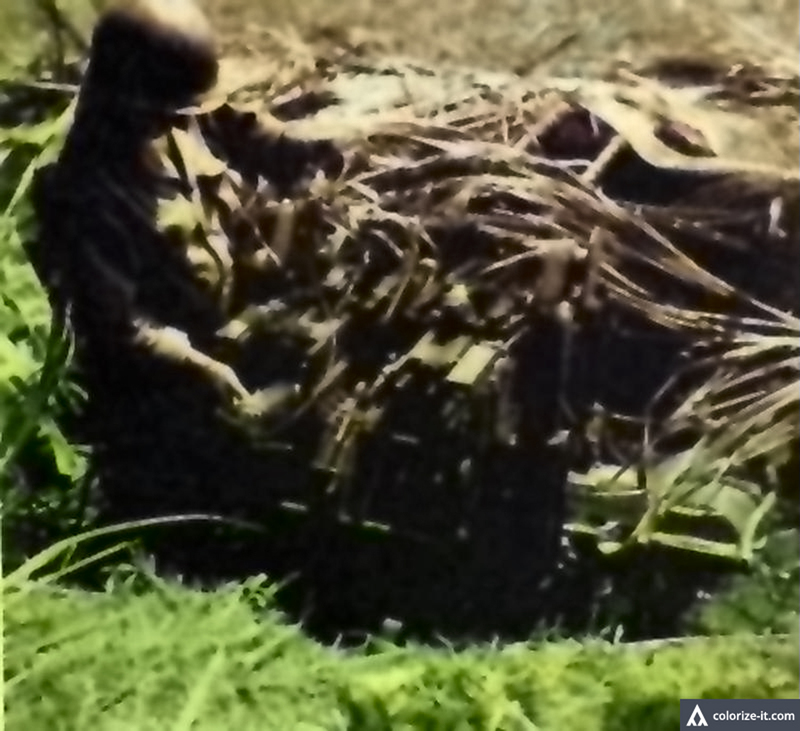 Image source: The Angels: A History of the 11th Airborne Division 1943-1946 by Maj. Edward M. Flanagan Jr. Colorized courtesy of Algorithmia. That mountain due east of the city of Lipa in Batangas which even many locals erroneously refer to as Mt. Malarayat is, in fact, a mountain range called Mt. Malepunyo; and Malarayat is just a hill to its side. 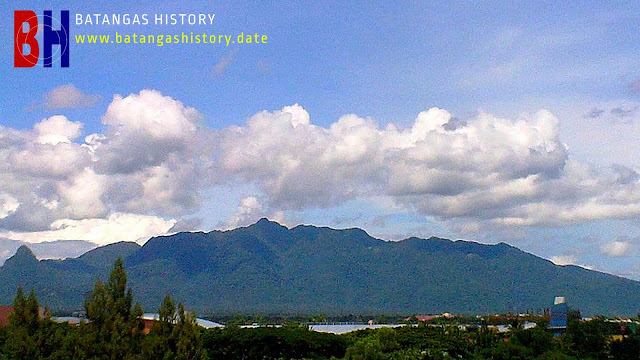 Malepunyo was, in 1945, where vicious fighting took place so that the United States Army could put an end to Japanese resistance in Batangas. 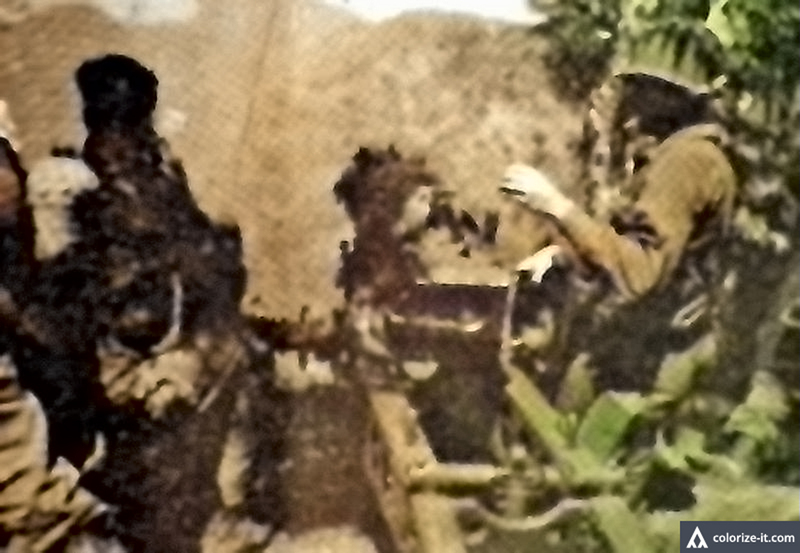 At this point in the war, with Batangas for all intents and purposes liberated from Japanese occupation, the 11th Airborne Division – which played a major role in the liberation campaign – had at its disposal resources in manpower as well as firepower that were erstwhile occupied elsewhere. Original caption: A howitzer section of Battery D, 457th, firing down the throats of the Japs in the Malepunyo hill mass. Image source: The Angels: A History of the 11th Airborne Division 1943-1946 by Maj. Edward M. Flanagan Jr. Colorized courtesy of Algorithmia. The 187th Glider Infantry Regiment, having just successfully accomplished the order to wipe out Japanese resistance at Mt. Maculot, had no time to rest and was sent to Tiaong to block the retreat of the Japanese from Mount Malepunyo. The 188th, meanwhile, was transferred to Alaminos and ordered to attack the mountain from the South. The lead group in the assault on Malepunyo, however, was the 511th Parachute Infantry Regiment. 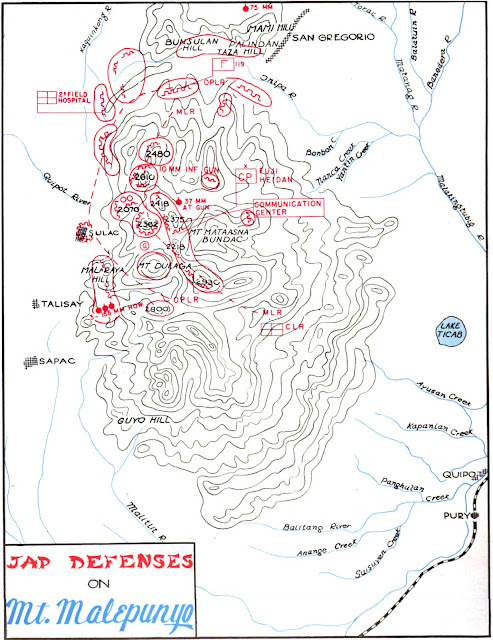 A map of Japanese defensive positions on Mt. Malepunyo. Image source: The Angels: A History of the 11th Airborne Division 1943-1946 by Maj. Edward M. Flanagan Jr.
Just to the northeast of barrios Talisay and Sapac in Lipa and southeast of barrio Sulok (called Santa Cruz in the present day) in Santo Tomas, the Japanese positions included “vast supply dumps, a hospital, artillery positions, and extensive underground caves, tunnels, and passageways.” There were no roads into this position so that the US Army’s Corps of Engineers had to work feverishly to create supply routes and passageways. The Americans surrounded the mountains with light and medium artillery and continuously pounded the Japanese positions. Pack howitzers3 were dismantled, taken up the mountains and reassembled. Tanks, chemical mortars and fighter-bombers were also used. Soldiers of the 511th, observing that the Japanese scampered to their caves at the sound of approaching fighter planes and quickly came out to man the outer defenses as soon the planes left, positioned themselves closer and mowed down the Japanese with gunfire as they came out. 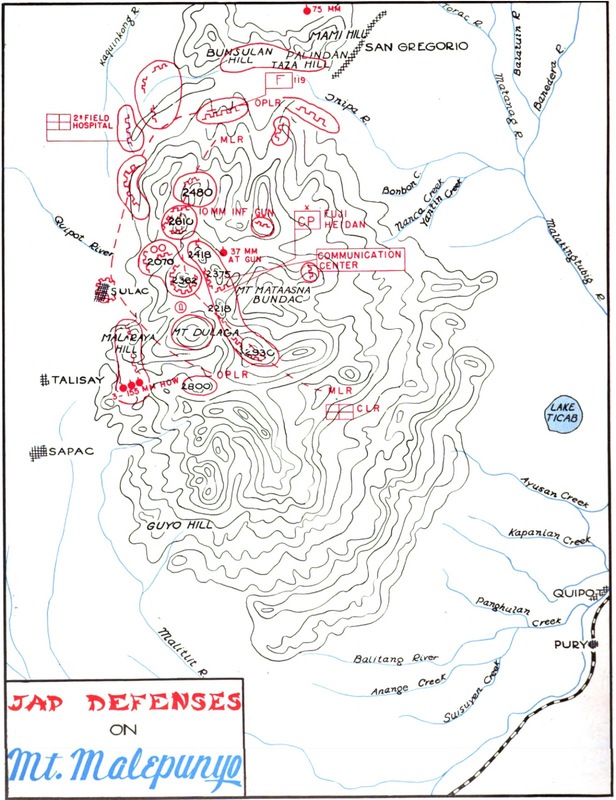 When the 511th met up on 30 April with forces of the 188th Infantry Regiment, who had moved up the mountains from the south and destroyed Japanese positions along the way, the battle for supremacy at Malepunyo was effectively ended. 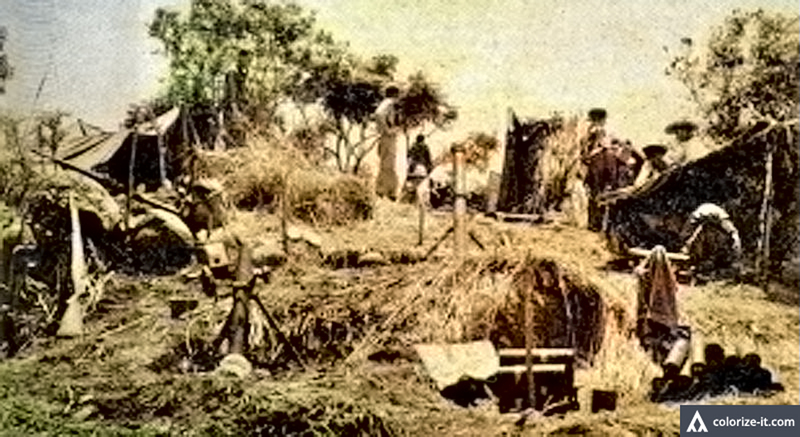 Later, captured maps and documents would show that it was there that Fujishige had placed the Japanese Army’s final stand not only in Batangas but also in the rest of Southern Luzon. Original caption: An engineer destroys a Jap 25mm gun near Sulac (Sulok). Image source: The Angels: A History of the 11th Airborne Division 1943-1946 by Maj. Edward M. Flanagan Jr. Colorized courtesy of Algorithmia. Present day Mount Malepunyo due east of poblacion Lipa City. 2 “US Army in World War II, The War in the Pacific, Triumph in the Philippines” by Robert Ross Smith, published in 1993 by the Office of the Chief of Military History, Department of the Army, Washington D.C.
3 Pack howitzers were guns that “could be broken down into several pieces to be carried by pack animals.” Wikipedia.